Utah numbers perk up, but a comeback is years away. Francisco Kjolseth | The Salt Lake Tribune Ivory Homes and other Utah builders took out more building permits in July than a year ago, but activity is off from peak years. Francisco Kjolseth | The Salt Lake Tribune Although new homes represent less than one-fifth of the housing market, they have an outsized impact on the economy. Each home built creates an average of three jobs and $90,000 in taxes, according to the National Association of Home Builders. The number of people who bought new homes nationwide fell for the fourth-straight month in July, putting sales on track to finish this year as the worst on records dating back half a century. The pain also is being felt in Utah, and although the hurt appears to be easing in some areas, recovery from the downturn will be years in the making. 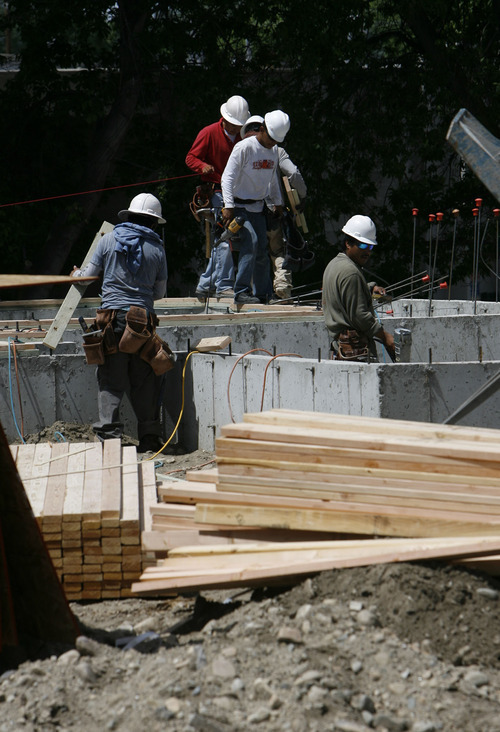 Builders took out the permits for the construction of 586 single-family homes in July, up from 317 last year, according to Construction Monitor, which tracks building activity along the Wasatch Front. 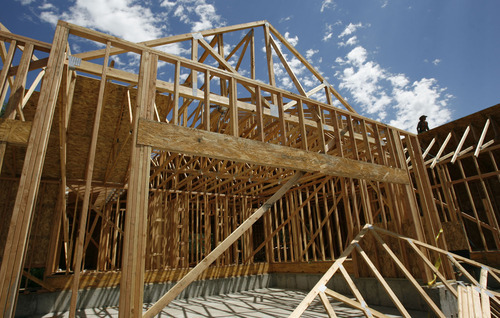 The numbers are up from last year, but the month's total is still dramatically off July 2006, a peak year for home construction when builders took out 1,128 permits for the construction of new single-family homes. Building permits, although not an exact comparison with housing starts (which are not measured locally), are a gauge of future construction. Although this year is shaping up to be a bit better than 2009, which probably will end up as the worst year for home building in Utah's most populous area in decades, that's not exactly good news, according to James Wood, director of the University of Utah's Bureau of Economic and Business Research. "We're at the same home-building level as the 1988 to 1989 time frame, but our population is more than a million higher. That just gives you an idea how devastating this downturn has been," Wood said. Sales of new homes nationally fell nearly 1 percent in July, to a seasonally adjusted annual rate of 298,000, the Commerce Department said Tuesday. That's less than half the 700,000 that economists say represent a healthy market. Housing remains the weakest part of the economy. Last year was the worst for new-home sales on records dating back a half century. Although new homes represent less than one-fifth of the housing market, they have an outsized impact on the economy. Each home built creates an average of three jobs and $90,000 in taxes, according to the National Association of Home Builders. But all sales remain weak. Sales of previously occupied homes fell in July for the third time in four months, and they are trailing last year's 4.91 million sales, the fewest since 1997. In a healthy economy, people buy roughly 6 million existing homes annually. High unemployment, stock market fears, larger required down payments and tougher lending standards are preventing many people from buying homes. A report last week on sales of previously owned homes showed that more sales than usual fell apart at the last minute, a sign that many buyers may be nervous about the economy. At least 16 percent of deals were canceled head of closings last month  four times the rate in May. Sales of new homes have fallen 18 percent in the two years since the Great Recession officially ended. A telling sign of how bad things have gotten for the housing industry is that prices have dropped more since the recession started, on a percentage basis, than during the Great Depression of the 1930s. And it took 19 years for prices to fully recover after the Depression.